gorgeous glowing skin. In order to achieve that I have to care for my skin and treat it with love. I want radiant, visibly hydrated and smooth skin. You know those women that have gorgeous glowing skin? They turn heads... that's who I want to be. So even though I've always been on top of my skincare, now that I am in my 30s I have to be even more strict with my regimen. I use a lot less makeup and actually enjoy going au natural on a daily basis. Especially if I am just working or running around town. I like to let my skin breath while caring for it with products that are healthy and effective. I've been using Tree Hut skincare for a couple of weeks now and I have to be honest, I love it a whole lot. 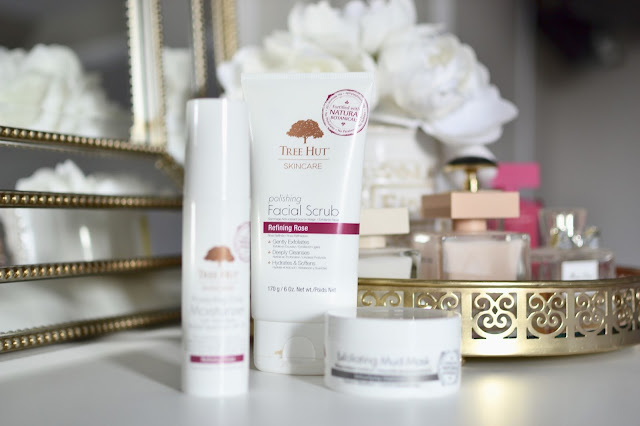 If you are looking to renew and refresh your skin I recommend you try Tree Hut skincare products, you won't be disappointed. I love these not only because they are great for my skin but because of Tree Hut's mission which is to love your own skin and always make time for yourself. It's so important to take care of our skin and bodies to feel great and be able to be happy women and happy moms. Tree Hut sources their natural ingredients, from central African certified organic shea butter to Polynesian coconut shells, from all over the world while still manufacturing their products right here in the USA. 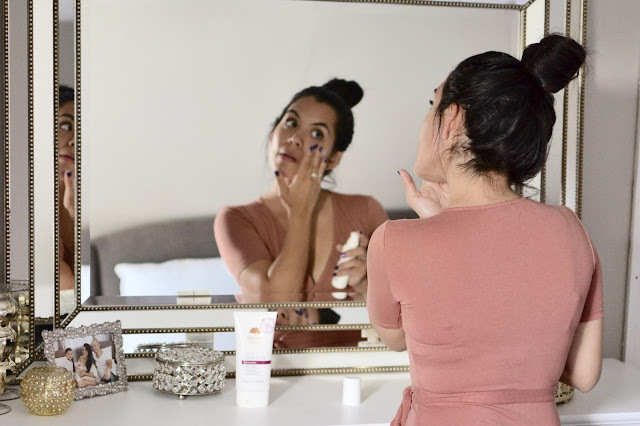 Here are the products I am using and loving and a glimpse into my step-by-step skincare routine. The Polishing Facial Scrub is one of my faves. There is just something about scrubs that make my skin feel so good after I wash it. I love this Facial Scrub in Refining Rose because it is gentle, it helps exfoliate, and get rid of my dead skin. It also gives my face the hydration it needs and leaves it feeling soft and glowing. The Protecting Daily Moisturizer with SPF 30 truly makes my face glow. From the very first day I used it, I've been loving it. I appreciate that it already contains SPF so I have one less step in my skincare routine. 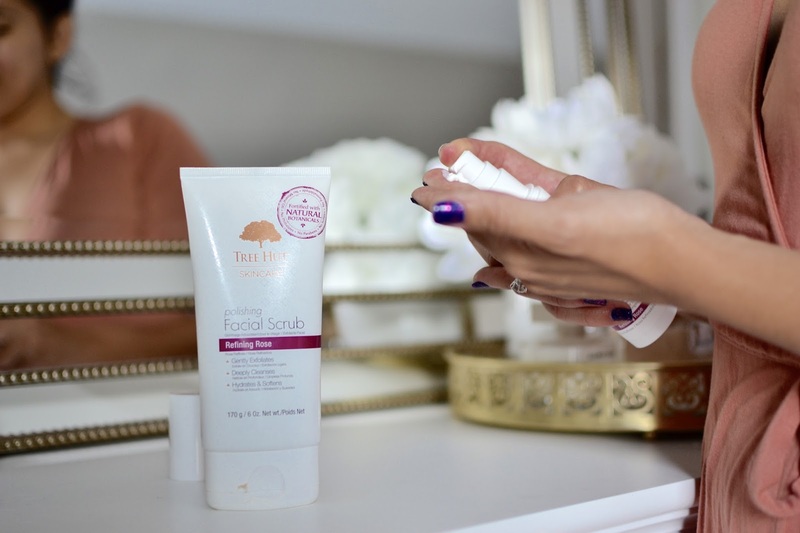 The product smells delicious and leaves my skin feeling clean and refreshed. One of the first products I was eager to try was the Exfoliating Mud Mask. I am a big fan of masks and even more so when they are mud masks. This mask not only left my skin feeling absolutely soft and clean but it also tighten and exfoliated it. After our Disney vacation and the sun, heat and pool, I needed that extra love. My regimen consists of using this Tree Hut Mud Mask 3 times a week and the results are noticeable from the first week. If you are looking for a new skincare line check out Tree Hut at Ulta or Amazon. The best part is Tree Hut skincare products are under $15. Get ready to fall in love with your skin all over again. Have you tried Tree Hut lately? Check out all their products HERE. Have a happy Monday! This post is sponsored by Tree Hut. As always, all opinions are my own. Thank you for supporting my blog and the brands I use and love.